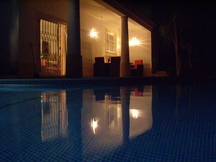 Charming Family villa in Guia with Private Heatable Pool and Garden. Peaceful location in Family area. 5 minutes drive to beautiful beaches. 30 minutes from Faro Airport. In the village of Guia which is close by the ZooMarine Park and Algarve Shopping Centre. From Faro airport follow signs to Guia village and then we will send more detailed directions to Quinta dos Alamos and the villas. Please quote reference:TF: 1131 villa "Casa dos Passarinhos"